Last week I had the great opportunity to produce a video for Blazin’ Paddles in Las Vegas, NV. 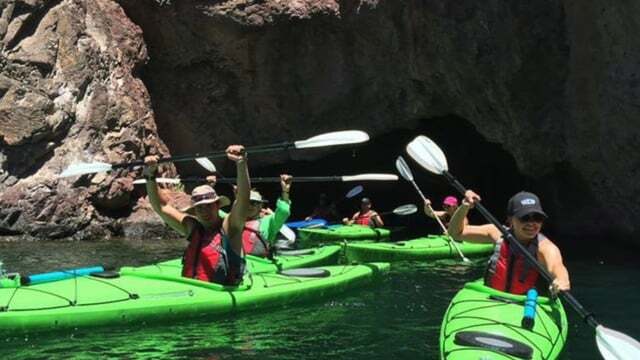 These guys offer some great kayaking tours (hence the name Blazin’ Paddles) down the Colorado River, featuring Black Canyon and more. They actually offer 2 tours per day. The half-day, 4 mile round trip, perfect for the novice kayaker, features Black Canyon and all the Big Horn Sheep you can spot. Even if you’ve paddled before, remember, it gets hot even over by Lake Mead in the summertime so you may want to pace yourself the first time out. But fear not, Las Vegas, thanks to all the sunshine, has a long paddling season. You can book your float down the Colorado River with Blazin’ Paddles from February to November! The full-day package has Black Canyon and the Big Horn Sheep but also includes Hoover Dam, more wildlife, cliff jumping and lots more. Both excursions come complete with shuttle service to and from the venues. So check out the video featuring the owner of Blazin’ Paddles, Ryan Borup. I think you will have just as much fun watching it as I had shooting and editing it. As far as the shoot itself, the interview was shot on a Canon 5DMKII using available light, and edited on FCPX. © 2016 Bombs Away Media, Inc.